Description: Thursday, Dec. 7th from 10 a.m. to 7 p.m., Aldridge Gardens will host the Second Annual “Gifts of Art" event! Enjoy one-of-kind works of art crafted by 12 hand-selected Alabama artists, working in ceramics; glass; wood; iron; jewelry; and fabric. Functional, wearable, decorative, and Alabama-inspired items, right in time for the season of giving! Rain or shine, this indoor show takes place in the beauty and comfort of the Aldridge Gardens gallery in Hoover. Bring a friend, come on your lunch break, or enjoy the evening with us. Free admission. 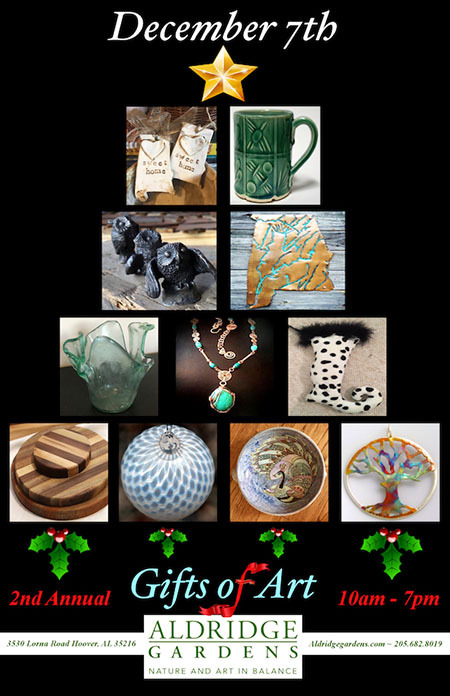 “Gifts of Art” is Dec. 7 ONLY. 10 a.m. to 7 p.m.